Buckeye Valley shortstop Andy Eurez fires to first base during Wednesday’s MOAC showdown against visiting Pleasant. The Buckeye Valley baseball team kept Pleasant under control for the first three innings, but the visiting Spartans got on track after that en route to a 9-0 MOAC win Wednesday afternoon in Delaware. Pleasant broke the scoreless tie with a run in the fourth before breaking the game open with a three-run fifth and five-run sixth. Buckeye Valley, meanwhile, never quite got on track. The Barons’ best scoring chance came in the bottom of the fourth. Travis Pennington and Evan Ulrich reached on back-to-back one-out singles before Kyler Lewis was hit by a pitch to load the bases. The inning fizzled from there, though, as a pair of strikeouts ended the threat. Pennington finished with two of BV’s five hits while Ulrich, Lewis and Zach Mitchell added the others. Ulrich was pegged with the loss, allowing six runs on seven hits while striking out seven and walking four in 5.1 innings of work. Big Walnut 10, Franklin Heights 0, 5 inn. Colton Lee and Noah Sprowls combined to toss a three-hit shutout as the Golden Eagles cruised to an OCC win over the visiting Falcons Wednesday in Sunbury. Lee picked up the win, allowing three hits while striking out six and walking one in four innings of action. Sprowls sealed the deal with a scoreless fifth. Austin Krinn, Ryne Conley and Jackson Seiple led BW at the plate, finishing with two RBI each. The Warhawks scored two runs in the bottom of the sixth to even things at three, but the visiting Patriots plated three in the seventh to notch a solid OCC win Wednesday in Westerville. Corbin Parrish singled to drive in Carson Comer and break the tie. Craig Lutwen scored on an error later in the seventh and Connor Osmond came through with a clutch two-out single to score Parrish and cement the final margin. Mitch Milheim earned the win on the mound, coming an out away from a complete game. He allowed three runs on seven hits while striking out nine and walking two. Jason Cross was sharp on the mound, allowing a run on five hits in his six innings of work, but the Pacer offense couldn’t deliver any run support Wednesday in Hilliard. Hayes managed just five singles in the setback, two off the bat of Dominic Byers. Olentangy managed just four hits off of Orange starter Hunter Andres, but scored a pair of runs via bases-loaded walks en route to an OCC win Wednesday in Lewis Center. The Pioneers scored the game’s first run in the top of the first, but the Braves plated the next three, scoring single tallies in the second, fourth and fifth. Orange got within one with a run in the sixth, but Olentangy added one of its own in the bottom half to smooth out the scoring summary. Sutton Bucci, Logan Ketron, Lucas Hassinger and Braydon Chitty knocked in the Braves’ runs — Ketron and Bucci’s coming on walks — while Zach Beatty and Robbie Dayhuff finished with one RBI apiece for Orange. Nick Foy picked up the win on the mound, allowing two runs (one earned) on four hits while striking out four and walking three in five innings of work. Andres, who allowed three runs (two earned) on four hits while striking out one and walking five, was pegged with the loss. Emma Schwinne finished a perfect 5-for-5 at the plate and Stacey Walters struck out 10 in five innings of work to lead Big Walnut to a 12-2 six-inning win over host Franklin Heights Wednesday in Columbus. Three of Schwinne’s five hits were doubles. She also drove in three runs and scored another. Other BW standouts included Meredith Thomas, who had two hits, two RBI and three runs scored; and Jojo Lucas, Walters and Karley Becker, who had two hits apiece. 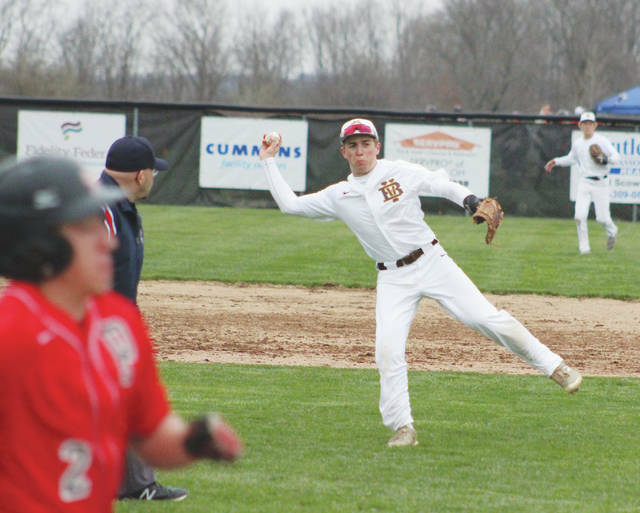 The Pacers scored three runs in the second to break the scoring seal, but the Panthers answered with a four-run third to take a lead they never relinquished Wednesday in Hilliard. Hayes, which outhit Darby 9-6, was led by Alex Armstrong, who finished with a homer and two RBI. Bobbi Adams and Liaiha Slayton were also solid, collecting two hits apiece. Olivia Davidson had a game-best three hits while Payton Cox had two and drove in a pair to lead the Braves to an OCC win over the host Pioneers Wednesday in Lewis Center. Sophie Low picked up the complete-game win in the circle, allowing a run on four hits while striking out six. Tatum Bardash finished with two of the four Orange hits. Arica Flaugher hit a solo home run to keep the Patriots close, but the Warhawks used a three-run sixth to pull away for an OCC win Wednesday afternoon. Delaware Hayes picked up a solid non-league win Wednesday, blanking Bishop Hartley 5-0. Pacer winners included Kyle Klumpp (6-1, 6-2 at first singles), Sam Bonofiglio (6-0, 6-0 at second singles), Eric Puthoff (6-1, 6-1 at third singles), the duo of Danny Brennan and Will Fogle (6-3, 7-6 at first doubles) and Justin Sanclemente and Jacob Byerly (6-2, 6-3 at second doubles). The Golden Eagles picked up a pair of singles wins, but it wasn’t quite enough to lift them past the visiting Wildcats Wednesday in Sunbury. BW winners included Gabe Mexicott (6-1, 6-0 at second singles) and Charlie Jaeger, who won by default at third singles. Also: Olentangy 4, Hilliard Davidson 1. Olentangy Liberty 64.66, Olentangy Orange 62.33. Olentangy Liberty 77, Olentangy Orange 54. Olentangy Liberty 10, Granville 8. Buckeye Valley 18, Jonathan Alder 5.